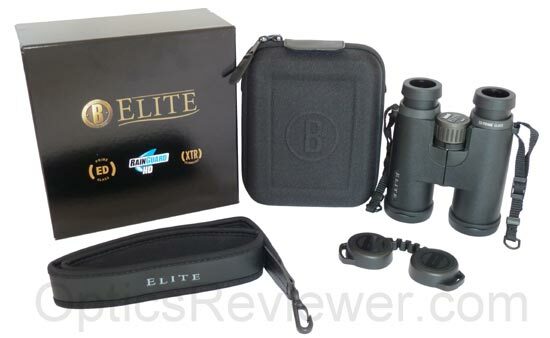 Bushnell Elite ED Binocular - A Worthy Grandchild to Bausch & Lomb's Elite? The Bushnell Elite ED binocular is the top-of-the-line binocular from one of the two most popular binocular companies today. You'd think there would be a wealth of information available about its optical performance, but we found the opposite to be true. We ordered one to satisfy our thirst for information! When it arrived, we had other binoculars lined up to test and review ahead of it and so didn't get to it right away. When we got it out in the field, however, we were taken in by the optical quality for the price. We took it to a favored location for its initial run. While one of the team was taking pictures of a relatively common (for the area) Great Blue Heron at the edge of a pond, another was using the binoculars in the hope that something else might be lurking nearby. The optics of the Bushnell Elite ED allowed the user to very nicely pick out the form of an unmoving bird nearly perfectly camouflaged to fit in with the colors of the recently fallen oak tree on which it was perched. Its initial pose was with its tail only a few degrees off from pointing straight up and its long neck extended toward the water's surface. Without moving, it blended in with the oak's appearance so well that the person watching thought it might simply be a strange looking part of the tree. When it moved it was obviously a bird and the camera's focus quickly changed. While we often miss pictures of the particularly well camouflaged animals we see, we were able to get pictures of that Green Heron to back up our story! Doesn't it fit in well with the background? (It's in both the left and right pictures above.) If not for the Bushnell Elite ED pulling out the difference in gray color and the more sharply defined body of the bird, we would have missed it! Would it surprise you to know that the Bushnell Elite binoculars have a history extending back over 60 years, including the years when they were known as Bausch and Lomb Elite binoculars? As optical advancements have been made, the Elites have been updated and upgraded to keep pace. The previous model did not have extra-low dispersion (ED) lenses and had a street price not much under $1,000. That model was revamped (the Elite e2 model, which was a "discount" version of the Elite, was discontinued), and street price for the Elite ED was set at about half that of its predecessor. 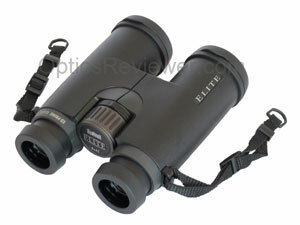 Today's Bushnell Elite ED binoculars are an excellent binocular value at a very good price of approximately $500. Since Bushnell Elite binocular reviews are far and few between — let's get going with this one, shall we? The body's design and engineering demonstrate both precision and elegant simplicity. While we don't test for design strength, it presents the impression of both strength and durability. The body appears to be assembled by a design team backed up by precision craftsmen with a strong interest in quality fit and function. Bushnell retained the magnesium chassis used for its top-of-the-line model when it updated the Elite binocular model. We bought the Elite ED 8X42 for testing and review and found it weighed only 22.4oz (635g). With the light, tough magnesium chassis, much of this weight will be from the optical-grade glass used in its lens system. 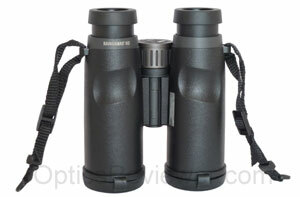 The size of this binocular is just 5.6 (14.2mm) inches tall and 5.0in (12.7mm) wide. It's a relatively small package for the amount of optical "power" it contains. One really doesn't get a feel for the small, comfortable size until actually using this binocular. It's very comfortably balanced and proportioned to provide for the forefingers to automatically rest lightly and comfortably on the focus wheel with the thumbs resting easily and naturally in the thumb indents on the bottom of the barrels. The relatively short barrels fit easily and comfortably into our average-sized hands. The design team got it right with the Bushnell Elite ED's balance and put thumb indents on the bottom of the barrels in the place where our thumbs naturally locate when using the binocular. The feel is good and contributes to being able to use the Elite for extended periods without significant fatigue in the arms and wrists. It's almost a given that roof prism binoculars of any quality will be waterproofed. While the Bausch and Lomb Elite binoculars of the early 1990s were not waterproofed, they were perhaps one of the last high quality roof prism holdouts in that regard. By the mid-1990s, Bausch and Lomb Elite binoculars were waterproofed. The waterproofing is what enables Bushnell to say that they're also fog-proof. Any water vapor inside the binocular is removed when the air is replaced by dry nitrogen gas. This prevents fogging on the inside lens surfaces where it can take a significant length of time to dry out. It also removes the moisture that's the principal cause of fungus growing on lenses and eating into their anti-reflective coatings. Of course going from a cool and dry area into a warm and humid one will still cause condensation to develop on external lens surfaces, but that soon disappears without causing any harm. 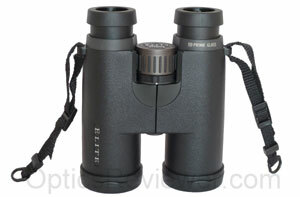 Bushnell has applied a permanent "Rainguard" coating to the exterior lens surfaces of Elite binoculars. Bushnell says that this causes moisture from rain, snow, or condensation to bead up and scatter less light than it would otherwise. If that's the case, it would seem logical that it would evaporate more quickly if it were beading up, too. We were curious about whether or not that would be true and put a Rainguard-treated binocular in a refrigerator along with an untreated one. Sure enough — the Rainguard treated lenses cleared significantly before the untreated ones. The eye relief on our 8X42 Elite ED was a generous 19.5mm. It seems most likely that this will accommodate nearly all eyeglass wearers comfortably. The 10X42 configuration is slightly less at 15.5mm. The eyecups on the Elite ED are of the twist-up&sol;twist-down variety. We like this style of eyecup better than the fold-down rubber type on full-sized binoculars. Many binoculars with this much eye relief provide multiple eyecup settings. This allows people to adjust for their individual preference in eye relief. The Bushnell Elite ED binocular's eyecups had two settings — fully retracted and fully extended. While it seemed unusual, we didn't find that we were uncomfortable with having just the two settings. We did notice that the eyecups on our binocular seemed to "lock" in the fully-extended position, but for some reason would slip down from time to time. Experimenting with the ones on our binocular suggested that it only took a little clockwise pressure to turn them enough start them retracting. Others, however, have said that they've not had any problems at all with their eyecups "self-adjusting," so we're tempted to assume that it's not a widespread situation. The focus wheel on this binocular turns counter-clockwise to go from close focus to infinity. While this bit of information doesn't matter to most binocular users, there are some who use their binoculars a great deal and find it easier to change binoculars than to develop a new habit! Bushnell has been listening to bird watchers, wildlife observers, sports fans, and others the world over! The Elite ED binocular goes from close focus to infinity in a single revolution of the focus wheel! While this may not seem like much to the new or casual binocular user, those who have spent a day counting birds, enjoyed an action-packed game at the sports stadium, or otherwise spent a great deal of time focusing a binocular will understand. A single revolution of the focus wheel seems optimal to us and you don't have to fiddle with focusing. Less than a revolution is too fast and results in time-consuming difficulty in focusing. More than a full revolution leaves you unnecessarily tired at the end of the day and spending time focusing that you'd rather be spending enjoying the view. The wheel presents a ribbed, rubberized surface that we felt would be easy to turn with both wet and dry fingers. While it turned smoothly and easily, it wasn't at all loose and it didn't lose its focus setting. For Those Who Wonder "Where are they made?" The plate with the instrument's serial number says that the Bushnell Elite ED binoculars are made in Japan. Japanese optical manufacturers have earned a reputation for quality optics as well as quality of binocular chassis and housing construction. This binocular contributes to that reputation. The older 8X42 Bausch and Lomb Elites had a 365ft (111.3m) field of view. Today's Bushnell Elite 8X42 binocular's field of view is 330ft (100.6m) and perceptibly smaller in our opinion. A large field of view allows for so much more enjoyment of a binocular that we're uncertain as to why the trend is toward narrower optics. At 330ft (100.6m), we consider the field of view to be average in today's marketplace, but certainly better than a number of other available binoculars. When we tested our Bushnell Elite ED binocular we found a satisfyingly-sized sweet spot where viewed images had very sharp details. Searching our hardest, we were unable to detect any softening of details until we were out about 47&percnt; of the radius from the center of the view. Even at that, we doubt that most people would notice the very slight softening of details in practical use that we felt we detected at that point. It wasn't until we were at about 82&percnt; of the view's radius from the center that we observed significant (more readily observable) fuzzing of the image. This blurring of details is significantly beyond the sweet spot and seems unlikely to be noticed with hand-held use because we naturally move the binocular to center an image in the field of view. 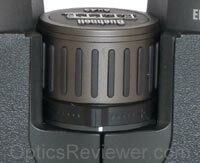 It may be more noticeable when used with an optional tripod adapter, since we tend to make greater use of the entire field of view without adjusting the tripod. What this means is that we found the diameter of the optical sweet spot to be of a size that provides a clean, clear, crisp view with little blurring of the lines at which colors join&sol;change. How does Bushnell accomplish this with the Elite ED's optics? The resolution of details contributes to the clarity and crispness of the image and Bushnell tackled that from both ends of the Elite ED's barrels. On the ocular (eyepiece) end, it used hybrid glass&sol;synthetic aspherical lenses to achieve a better resolution that most oculars will provide. We've been sold on the aspherical lens concept ever since we had one of the first widely advertised binoculars that used them. On the objective end of the binocular barrel it uses Extra-low Dispersion (ED) glass for the objective lenses to again cause the various colors to converge to achieve a sharper resolution of detail. If you haven't used a friend's binocular with ED objective lenses, we can assure you that just using ED glass for the objective lenses can make a significant difference in the resolution of detail and sharpness of colors. Now imagine the results achieved when aspherical oculars are coupled with objective lenses made of ED glass…. Another element that should not be ignored is that Bushnell Elite ED binoculars use the highly reflective dielectric prism coatings means a brighter image, which in turn allows us to see more details in the view. Finally, while it is usually assumed at this price point, we'll mention that the optics are fully multi-coated and the BaK-4 prisms have phase correction coatings — both of which enhance the resolution of details. We felt that the color neutrality was good with the Bushnell Elite ED and that the vibrancy of the colors was such that it would be difficult for most to note any color bias in the view. We did not notice a significant color bias with the unit we purchased and tested. Chromatic aberration did not seem to be significant, although it was possible to see very modest amounts when viewing a white object against a light background. We didn't feel it was enough to be noticeable to most users under field conditions and did not find it objectionable in our testing. Bushnell has applied what it calls XTR coatings to the Elite's optics. That means 60 micro-thin layers of anti-reflective coatings applied to the prism and lens surfaces to increase light transmission by minimizing loss due to scattered light. Does it make a difference? We thought so. We took our unit out at twilight and watched deer until it became dark. 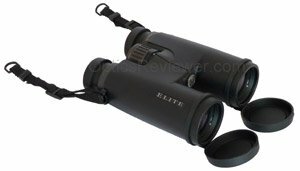 The Elite ED performed as well as or better than other binoculars in its price category and was quite competitive under those conditions with binoculars costing twice as much or more. We were frankly delighted with its low-light performance. When we took our Bushnell Elite ED binocular to a parking lot at night and focused on the bright lights, it demonstrated a minimal amount of spiking from the lights. How Close Could We Focus Our Bushnell Elite ED? The Bushnell specifications for the Elite ED say that both the 8X42 and 10X42 have a close focus of about 8.0ft (2.4m). When we measured the close focus possible with our test unit we found we were able to focus clearly on objects and activity as close as 6.3ft (1.9m). This is certainly within our recommended 8.0ft (2.4m) close focus distance for optimal viewing pleasure for birders or those wanting to closely observe butterflies, dragon flies, bees, and other creatures at close ranges. The diopter adjustment on the Bushnell Elite ED is immediately forward of the focus wheel and has a small raised nub that allows you to see and feel your diopter adjustment fairly easily. As you change the adjustment, you'll feel indents so that you can leave the setting without worrying that a minor brush against your clothing or other gear may change it unintentionally. It's not a locking adjustment, but it's about the next best thing and seemed to be effective in use. Manufacturers are limited in the amount of money they can put into cheaper optics to achieve depth of view (also called "three dimensional effect") and still sell a competitively priced binocular to make enough money to stay in business. We can quickly identify those binoculars simply by the fact that every time we change the viewing distance, we must change the binocular's focus. That means continuously working the focus wheel back and forth as we turn our attention to views at varying distances. Over the course of a day's outing, that can become quite tiring! Naturally, the depth of view, or three dimensional effect, with the Bushnell Elite ED may not be as great as with a Porro prism. However, we quickly noted that our index fingers did not have to "saw" back and forth on the focus wheel for each change in viewing distance. This is a significant amenity that is often provided in binoculars at price points where manufacturers can recover its production cost. It's also a benefit that many of us overlook until we've had opportunity to experience it. Given a choice, we'll take a binocular we don't have to continuously work at focusing any time! When we opened the box our Bushnell Elite ED binocular came in, we found it enclosed in a soft, black, cloth bag with a drawstring and inside what appears to be a resin-molded carrying case. The carrying case is not hard sided, but is firm enough to protect the instrument from reasonable weights that may be placed on top of it from time to time. Its zipper has two pulls which allow it to open as though hinged on the bottom. A nice touch is the nylon mesh side inserts which keep the front of the case from just dropping down and allowing the binocular to fall out accidently. The carrying case includes a nylon shoulder strap and inside there is enough room for a small map or thin pair of gloves. Also in the box were the user manual and warranty registration information and a lens cleaning cloth. Although nearly all binoculars come with a lens cleaning cloth, we don't care to use that sort of thing for cleaning dirt or smudges from lenses. We find a LensPen (Amazon.com or Amazon.co.uk ) to be better or, what we feel works even better, is the Carson Lens Cleaner with Dry Nano-particle Cleaning Formula for about the same price. We found the rain guard to protect the ocular lenses from rain showers would sometimes come off when we weren't necessarily intending it to do so. Not all the time, but often enough that we noticed it. It doesn't seem like a killing matter since, if we encountered rain it would be an easy enough matter to press the rain guard over the eyepieces and narrow the interpupillary distance slightly to keep the rain guard in place. We also found that the objective lens covers didn't stay in place, but tended to drop down when we weren't looking. While they're nice, we don't consider objective lens covers as critical and we simply took them off and left them in the box so we wouldn't lose them. We can assure you that the quality of optics and manufacturing fit and feel in the Bushnell Elite ED binocular make it a very good value. We can recommend the Bushnell Elite ED binoculars with pleasure. Bushnell has increased the competitiveness for binocular manufacturers at this price point by introducing a binocular priced toward the higher end of mid-range binoculars, but performing at the introductory level, or better, of high-end binoculars. We generally find the best prices for the Elite ED binoculars at Amazon, but comparison shopping is good. Here are direct links to the Elite EDs available at Amazon.com for North America and Amazon.co.uk for our friends living in the UK and South Africa. We're guessing that birders, rural homeowners, outdoors people, astute hunters, and many others will take advantage of Bushnell's upping the ante with the Elite ED. The regular Bushnell Limited Lifetime Warranty applies to the company's Elite ED model, too. It warrants that the Bushnell Elite ED binocular will be free of defects in materials and workmanship for the life of the instrument or it will be repaired for a small sum to cover shipping and handling. It's an excellent warranty. Because we were just as curious as anyone else, we've also compared the Elite ED binoculars with the Nikon Monarch 7 and Vortex Viper HD binoculars. We're happy to share our thoughts through our comparison of Elite ED, Monarch 7 and Viper HD article.